My Clothes Don’t Fit Anymore! One of the hardest things I had to do after practicing Intuitive Eating for a while was come to terms with the fact that my clothes would fit differently. I had hoped that my lean figure was my natural weight, but deep down I knew that it wasn’t. Because I was underweight and heavily restricting food, putting on some weight once I began to eat according to my body’s signals made sense. As predicted, my clothes began to slowly become tighter and I needed to start thinking about purchasing some new outfits to fit my slightly softer but much healthier frame. As I crept towards my natural weight, I began to accept that buying new clothes was inevitable. I’m a baby-step kind of gal, so I decided to start small with buying new exercise clothes! I had never purchased smaller exercise clothes when I began to lose weight, so they were very loose and hung off of my shoulders and hips. I actually liked them baggy because I felt smaller, but, like clothes that are too tight, having clothes that are too loose would not help me. Seeing myself in frumpy sweats would not bring me any closer to accepting my body. As it turned out, I thought that I looked better in my new, form-fitting exercise clothes than in my older, loose ones! After tackling getting rid of my loose clothes, I gathered some inner strength and turned my attention to the clothes that were beginning to be too tight. Buying exercise clothes was actually relatively easy because I was buying a smaller size. Replacing clothes that were too tight meant that I had to shop for larger sizes and I naturally resisted. 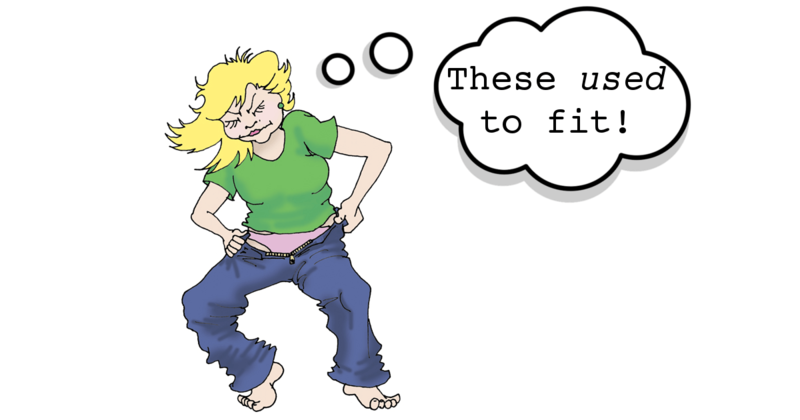 I stuck with my too-tight clothes for a few weeks, but I began to feel triggered into dieting since my clothes didn’t fit well. I knew I had to put on my big girl pants3 and buy new clothes because I did not want the tightness of my clothes to push me back into diet mode. I’ll admit that I’m cheap,4 so I flinched at buying a pricey new wardrobe. I got over this pretty quickly by reminding myself that clothes are just things and that my mental and physical health are more important. I picked up a few cost-saving strategies like getting a few key items that go with anything, shopping at thrift stores, and going to a seamstress for alterations. There were times when I had to simply buy brand new items though. For example, I needed new underwear to accommodate extra padding on my hips and bras because the girls had plumped up a bit,5 and I did not want to purchase these items secondhand. No matter where I shop, I do my best to ignore the size on the label6 and try on new clothes in the dressing room with my back to the mirror. I sit, bend over, and wiggle all around in the clothes to see how they feel…without the influence of the mirror. Does it pinch anywhere? Am I comfortable when I sit down? After I make that assessment, I turn around and take in my reflection. I have found that if I first think about how the clothes feel on my body, I am more pleased with the purchase than when I base my purchase on simply how they look. Yes, I bought new clothes, but I wasn’t sure how to deal with my old clothes. Some were easy to part with while some I had an attachment to because they represented my dieting success and everything that went along with that. My loose-fitting exercise clothes went right into the donation pile, but the first pair of jeans I bought after losing weight was another story. I put the jeans in a box and tucked it away in the back of my closet until I was ready to part with them. When those were added to the donation pile, there was a period of mourning. I felt like dieting was such a big part of my life that by putting those jeans in the donation pile, I was giving up part of my identity. My therapist worked with me on how to deal with my clothes not fitting anymore.7 She suggested that I thank them for their service and move on. At first I thought it sounded a little corny, but I knew the purpose would be to have a sense of closure. I could say to my pants, “Thank you for keeping me warm last winter. Now I will donate you and you can keep someone else warm.” Even though I felt silly saying this, it worked because what initially was a feeling of loss became something more positive. I have resolved to buy clothes that fit me now and not the body I wish I had. I have even started to cut the tags off of my clothes because the number or the letter indicating size does not define me as a person.8 I see this as taking a step towards self-care because this action is guiding me towards being at peace with who I am and body acceptance. I actually feel more confident now because my clothes fit well and accentuate my positive attributes. I really should have purchased new clothes sooner! What has your experience been when you need to buy new clothes? Please share in the comment section below. 1Read about how this book helped me get help in “Almost In Denial“! 2The post called “Freedom of Mind” delves into how liberated I felt when my mind was free of these obsessions. 3Ooh, that’s a bad pun, sorry! 4My husband says I get this from my grandfather. I hate to say he’s right…but he’s right. 5My husband has not complained about this one bit! 6Vanity sizing is so manipulative! This topic is on my mind and will be written about soon. 8I wrote a whole article called “Numbers, Numbers Everywhere” about the prevalence of these numbers in our society. I LOVE this idea!! I’m going to start this immediately. I’m so glad that line resonated with you! Let me know how it goes.